Coney Island Sauce Wisconsin Style is delicious! The longer the sauce cooks, the better it gets. The darker the beer, the richer in flavor the sauce will be. 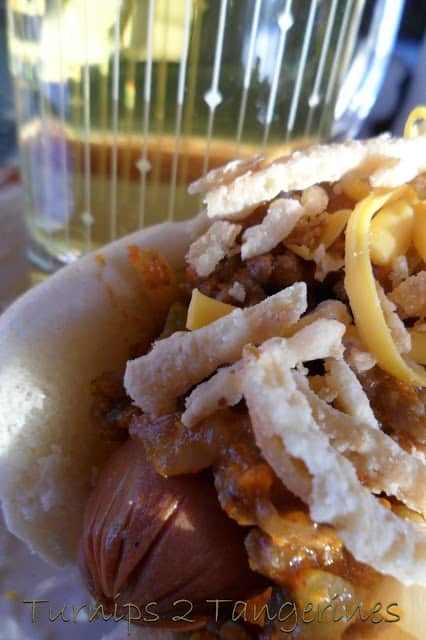 We call this a “Wisconsin Coney” because of the addition of secret stadium sauce and beer to the sauce recipe. Plus, each all-beef hot dog is topped with a handful of shredded sharp cheddar cheese and French’s French fried onions. What is Secret Stadium Sauce? 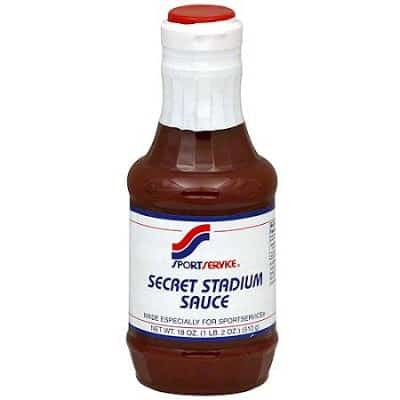 What is Secret Stadium Sauce? Secret Stadium Sauce is a popular condiment at Miller Park in Milwaukee WI home of the Milwaukee Brewers. It’s served with hot dogs and brats at Miller Park. The dogs and brats are actually dipped into the secret stadium sauce and the sauce is served on the side. The sauce can also be found alongside those large plastic ketchup and mustard pump thingy things on the “mini” condiment stations. Here is a fun way to serve Coney Island Sauce and Hot Dogs. Heat Coney Island sauce in a crock-pot set on low. In a second crock-pot set on high, heat a package or two of hot dogs. Serve buns, condiments and any other hot dog “toppers” on the side. This is a great self serve way to serve “dogs” for birthday parties, graduation parties, baseball games or while tail-gating before baseball games or football games. Coney Island Sauce Wisconsin Style is a super delicious sauce served on hot dogs or brats. Brown ground beef in a large skillet with chopped onions and green peppers. Drain off fat. Add tomatoes, tomato soup, diced green chili peppers, chili powder, curry powder, garlic powder, red pepper, salt and pepper, brown sugar. dried chili peppers, stadium sauce or chili sauce and one bottle of beer. Stir together well. Bring to a boil, reduce heat and simmer, uncovered for 2 hours or until sauce is thickened. Top dogs with meat sauce, french fried onions, crushed corn chips and/or shredded cheddar cheese, chopped onions, relish and condiments of your choice. Serving: Place sauce in crock-pot. Turn to low or warm setting. Keep sauce warm while serving. Place hot dogs in second crock-pot. Turn to high until hot dogs are heated through. Turn crock-pot to low to keep hot dogs warm while serving. Fruit Salad Tossed with Noosa Yogurt is perfect to serve with any summertime dinner, served outside at the picnic table. G'day! love chili dogs, true! Bring me right back to my childhood memories, so for that through your recipe and photo today…thank you! This sounds great… Thanks for sharing on Foodie Friends Friday and I hope that you will join us tomorrow for our Caramel Party. Chili dogs, YUM!!!!!! Great chili recipe!!!! Great for the summer! Lynn! Uhhh yum! That dog is looking mighty fine! Thanks for cooking it up with us! I'm a big fan of well-dressed 'dogs' and your recipe looks delicious. I'm going to have to make these for grampy. He's going to luuuv them. Get in my belly! These look so yummy! Now this is a chili dog I would like!